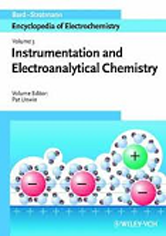 Editor/Author Bard, Allen J., Stratmann, Martin and Unwin, Patrick R.
Unrivalled in its breadth and depth, this 11-volume encyclopedia provides both an easy introduction to all topics related to modern electrochemistry as well as a comprehensive overview of the subject. Throughout, the emphasis is in easy access to information, with every topic treated at an introductory, medium and advanced level. This first-class reference work is edited and written by renowned scientists, covering everything from fundamental research to areas of application. Alan Bard, experienced editor of the Journal of the American Chemical Society, is one of the most renowned experts in electrochemistry and one of the editors-in-chief.